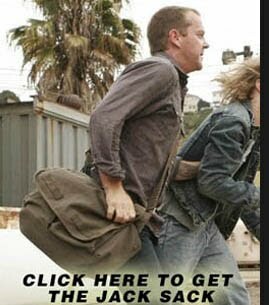 The Jack Sack™: Jack Bauer Has Hobbies! 1. 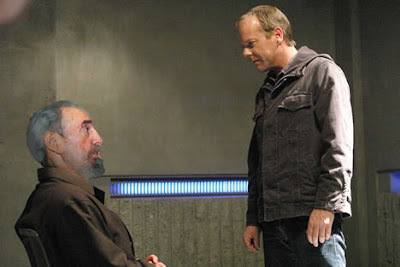 Jack Bauer Decides Fidel Castro Is Done. Why did the Bay of Pigs invasion fail? Because Jack Bauer was split genetically between his father's seed and his mother's egg at the time (Bauer was born in 1966 according to his Apostles). Ridding the world of Castro's rule has always been on Jack's list of things to do, but a few things popped up along the way (the terrorists, the dead wife, more terrorists, some nukes, some nerve gas, a treacherous President, some dead Presidents, etc). Anyway, the show's hiatus let Bauer do a little Spring cleaning down in the "Holiday Isle of the Tropics." Details are sketchy, but we all know the results-- Castro has been retired. ¡Viva Jack Bauer! 2. Jack Bauer Destroys Mysterious Spy Satellite Carrying The Plague Of The Apocalypse. In case you're still hiding under your desk, we've got good news to report-- Jack Bauer has destroyed the spy satellite that was set to crash into your home in a few days. 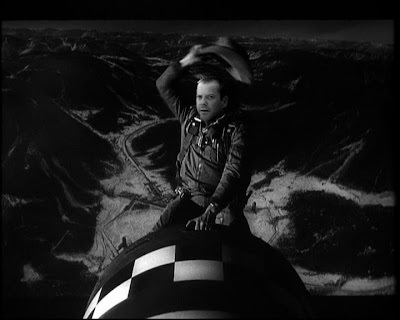 Bauer heard of the U.S. Navy's plan to send a computer-guided rocket to take out the errant satellite and insisted on doing his part. He personally guided the missile to its intended target in outer space. The Defense Department released an official photo of the mission. Thanks to Jack Bauer, we have been spared exposure to the so-called "toxic fuel" that was set to rain on us all. 3. Jack Bauer Is Annoyed By The Moon. So, while on his way into orbit to destroy the satellite, Bauer realized he forgot his signature aviator sunglasses. DAMMIT! Annoyed by the bitchin' glare he was catching off of the Moon, Jack decided to move the damned thing... behind the Earth.. out of the sunlight. If you doubt me, check your timelines. The "eclipse" happened at 10:30PM EST. The satellite was destroyed when? Shortly after 10:30PM EST. Don't worry, he put the Moon back where he found it after he was done. After all, the man does like to surf. Unfotunately, he still has no control over Kim. Stay tuned for more updates on Jack Bauer's new hobbies. h/t to Haley for instrumental involvement in this article. OK, totally unrelated to this post, but have you seen the kettle chip commercial where there are four people in a car, and the dude driving can identify the shape of the chip by the sound of the crunch? Yeah, I'm fairly sure he's doing a Kiefer impersonation. It's uncanny.